Read on to learn how Evanston Athletic Club moved on from spreadsheets and utilized Pipedrive to improve lead management and sell more. Evanston Athletic Club offers a wide range of health services on top of providing the community with an easy, efficient, and friendly place to exercise daily. Some of their club features include a panoramic simulator golf studio, a lap pool, a basketball court and even a climbing wall. Most of Evanston Athletic Club’s business comes from two main sources: walk-ins and web inquiries. Before using sales software, they used on Excel sheets to track follow ups, such as calls, emails and scheduled tours around the club. For walk-ins that aren’t signed up immediately, it is extremely important to follow up. For the web-leads, getting them through the door is the challenge. It is important to monitor when you called them, when you emailed them, what you’ve offered, etc. 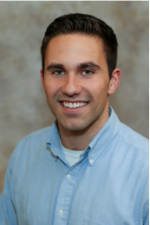 A close friend recommended Pipedrive to Kellan Strobel, the club’s Membership Advisor, as a cost-effective and intuitive CRM solution. Now, with the help of Pipedrive, they are able to easily track all interactions with potential customers, making sure that they follow up in a timely manner at crucial stages in the sales process. Something that was extremely difficult to do when using just spreadsheets. 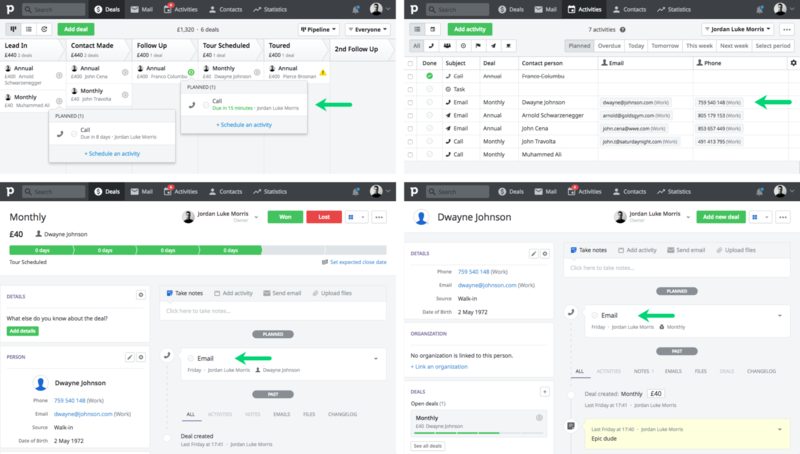 Not only can Pipedrive track the activities and interactions that you have had with the customer but it also allows you to see all the email conversations that you and your lead have shared. Pipedrive is built around the concept of combining the pipeline view and activity-based selling, so activities need to be flexible and fit your sales process. This is a key feature that is missing from spreadsheets. Pipedrive allows you to customize and link activities between deals, contact people and organizations, making sure that you have visibility on all interactions made no matter what details page you are looking at. Spreadsheets lack that ability, meaning that it is easy to overlook important calls or emails. Pipedrive makes sure that you and all users have visibility on all interactions made no matter what page you are looking at. According to Strobel, as soon as they made the switch from spreadsheets to Pipedrive, everything else was history. Pipedrive’s clean minimalistic style was just perfect for their needs. The only customization they needed was to change the Pipeline stages to better fit their sales process. They imported their prospects from the previous month into Pipedrive using the easy and intuitive built-in import tool, and continued from there. What is Pipedrive in your own words? 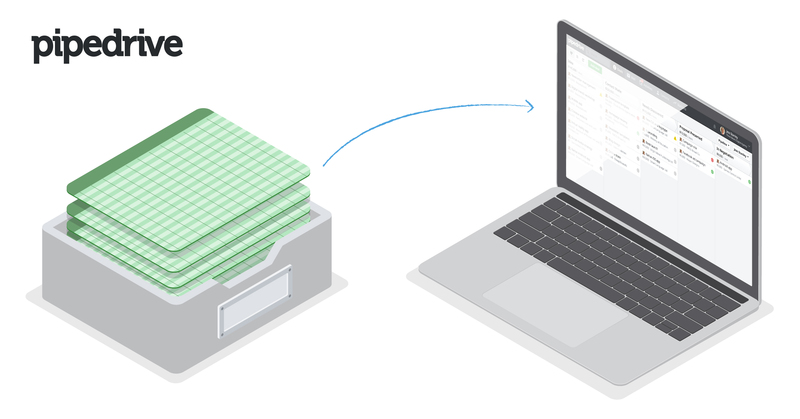 What can you do with Pipedrive that you can’t with spreadsheets? Easily add and track activities to deals and prospects. Something very difficult to achieve with spreadsheets. Share information between members in your team. In Pipedrive, you can simply invite team members as users and share/assign deals and prospects. Use the mobile app when you are on the road. Spreadsheets are not easily accessible when you’re out and about. With Pipedrive’s mobile app you will be able to access all your data anywhere at the tap of a button. Pipedrive’s web forms feature can automatically create deals and contacts from inquiries on your website. Seamlessly integrate with other software, such as; Gravity Forms, PandaDoc, Xero, and many more. How to import prospects and deals with activities? 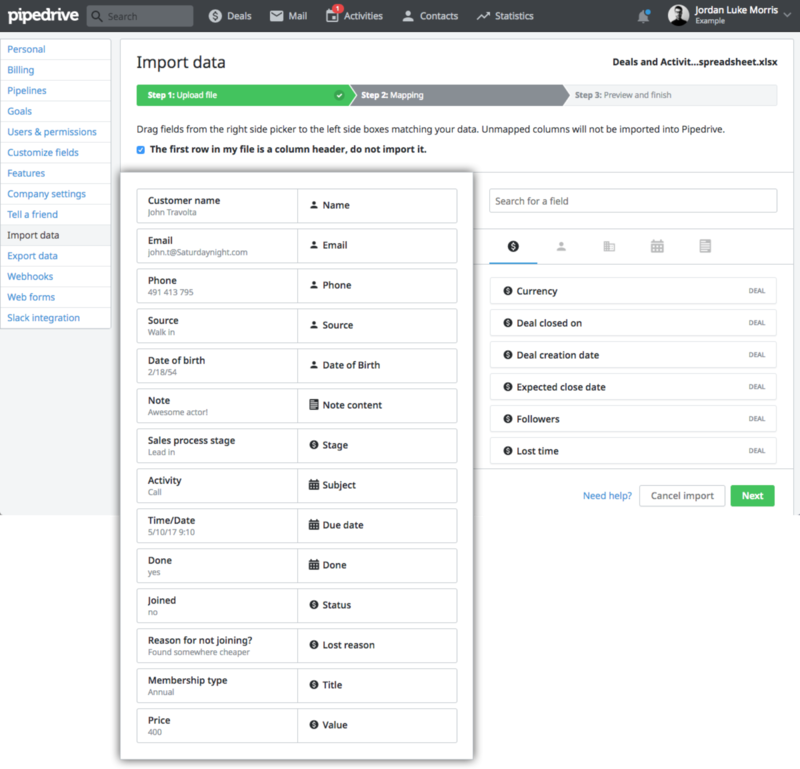 Pipedrive’s built-in import tool is probably the market leader when it comes to ease of use. Although the word import sounds scary, Pipedrive makes it a breeze. Simply map the fields you have in Pipedrive to the columns of your spreadsheet, let Pipedrive take care of the importing and you’re done! Below you will find an example on how to import your old spreadsheets to Pipedrive. We hope that you’ll use this as a guideline for when you are importing your files. The fields “Source” and “Date of Birth” are custom fields which can be added in Settings > Customize fields. Quick Tip: Pipedrive will recognize a duplicate contact person by Person Name + Person Email/Phone and merge them at your command. For a contact organization it is Organization Name + Organization Address. No matter where you are in Pipedrive, whether it’s in the pipeline view, the details view or the list view, we will always remind you of your scheduled activities. Below are a few examples. 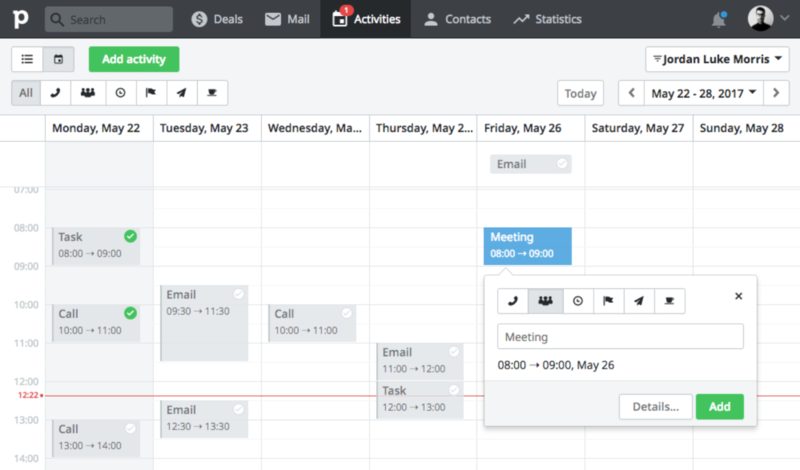 Tracking and scheduling activities in Pipedrive is even easier now with the new Calendar view. Here you can add, edit and view all your activities scheduled in a week by week overview. We hope you found this guide helpful and that we’ve managed to show you how easy it is to graduate from spreadsheets to Pipedrive. As always, our support team is at hand to guide you through the entire process if you have questions.